Photo: Jud Heathcote with Mark Few (right) and Tom Izzo at a Michigan State-Gonzaga game on Dec. 10, 2011 at the McCarthey Athletic Center. Photos below, Gonzaga's Kyle Wiltjer (33) and Kevin Pangos (4). Jud Heathcote, whose second team has been Gonzaga since he retired to Spokane 20 years ago, enjoyed another year of Bulldogs basketball with his courtside seats at the McCarthey Athletic Center, although he didn’t make it to Las Vegas to follow the No. 7-ranked Bulldogs’ most recent three wins. But make no mistake, the old coach is well versed on the Zags, even if he has to watch them the same way he follows the Spartans – on the satellite TV system his protégé, 20th-year Michigan State head coach Tom Izzo, bought for him. 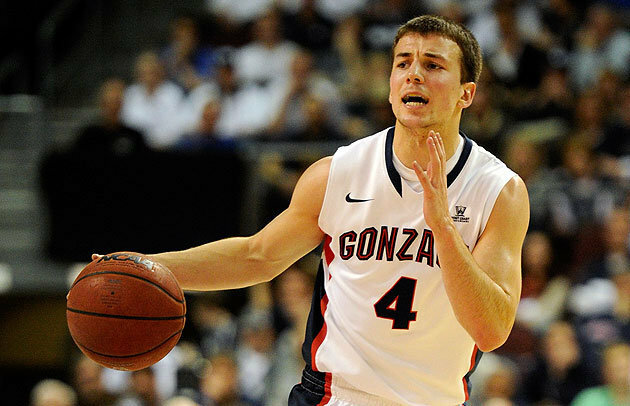 “This is Mark’s best team,” said Heathcote of Mark Few, the Zags’ 16th-year head coach. Gonazga is playing in the NCAA tournament for the 17th straight year and opens without having to leave the state of Washington. The No. 2-seeded Bulldogs (32-2) face No. 15 seed North Dakota State (23-9) Friday at the Key Arena in Seattle. The Zags’ streak of 17 NCAA tournaments is the fourth longest behind Kansas (26), Duke (20) and Michigan State (18). But unlike the other major programs, mid-major Gonzaga doesn’t have a national title within that streak or even a Final Four trip. The streak began in 1999 with a loss in an Elite Eight regional final with Dan Monson, son of Don Monson, Heathcote’s top assistant in his first two years at Michigan State. Dan Monson capitalized on his Gonzaga success with a stepping-stone leap to Minnesota. That lasted seven non-descript years until he was fired (he’s now the head coach at Long Beach State). Meanwhile, then-Gonzaga assistant Mark Few was promoted to head coach and resisted numerous offers to leaving for major programs; he has the Zags in the NCAA tournament for the 16th straight year, including four Sweet Sixteen trips. But that has been the knock on Gonzaga and Few – the Bulldogs haven’t advanced past a Sweet Sixteen game. Few’s Sweet Sixteen losses, though, are nothing at which to sneeze: 2000 to Purdue and College Basketball Hall of Fame coach Gene Keady; 2001 to Final Four team Michigan State with Heathcote in the stands at the Georgia Dome; 2006 to national runner-up UCLA; and 2009 to national champion North Carolina. Heathcote sites Gonzaga’s talent, size and experience when stating this is Few’s best team. “If you analyze teams and what they need to advance, size and good guards is usually the answer,” he said. “Well, they have size and they have two guards that are four-year starters in (Kevin) Pangos and (Byron) Wesley. They have (Przemek) Karnoski, a 7-footer that played well in the WCC tournament, better than he did in the regular season. And they have (6-10 Kyle) Wiltjer, who scored 45 against Pacific. He’s a threat every time he has the ball. And they have some good players coming off the bench. Another element of the Gonzaga lineup that Heathcote likes is three veterans in a three-guard offense complemented by enough big men to match size with any opponent, including Kentucky. Pangos, the WCC Player of the Year, and Wesley, are the fourth-year starters, although Wesley escaped USC as a three-year starter to transfer to Gonzaga and enjoy the fruits of post-season play. Gary Bell Jr., the WCC Defensive Player of the Year, is the third guard, and he’s a third-year starter. Mid-major guards are often under-sized and have to out-scrap the major school’s guard, but Pangos is 6-2, Wesley 6-4 and Bell 6-2. The formula for mid-majors to upset majors is to have veterans guards that outplay younger guards in pressure-packed situations. Wiltjer is a junior transfer from Kentucky and WCC Newcomer of the Year that played on the Wildcats’ 2012 national championship team as a freshman. 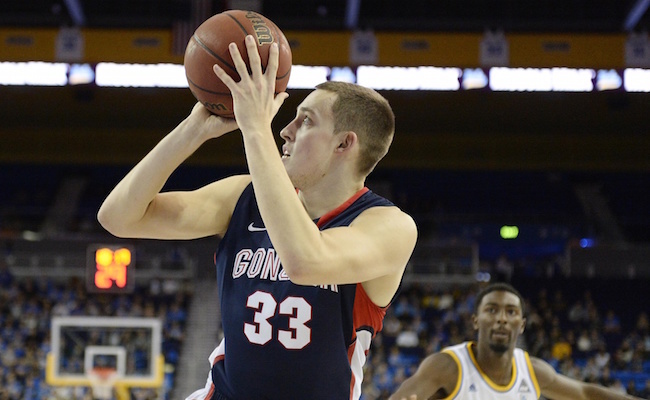 Wiltjer, who is from Portland, Ore., and was recruited by Gonzaga out of high school, played in 40 games as a Kentucky freshman and was the SEC Sixth Man of the Year as a sophomore before he left and sat out 2014 as a transfer while learning the Zags’ system. Karnowski (7-1, 288) is from Poland and backup freshman center Domantas Sabonis (6-10, 231) from Lithunania. He is the son of the former Soviet Union Olympic star and NBA player with Portland Trailblazers, Arvydas Sabonis. Few’s ability to attract transfers and recruit foreign talent is a major reason Gonzaga has remained a nationally-ranked program without fading off the radar as many mid-majors do following the graduation of a strong recruiting class. “He’s been lucky with transfers and foreign athletes,” Heathcote said. Among the starters, Pangos averages 11.5 points and 5.0 assists, Wesley 10.8 points, Bell 8.2 points Wiltjer 16.7 points and Karnowski 11.0 points with 5.8 rebounds. Sabonis adds 9.5 points and 6.9 rebounds off the bench. If Gonzaga beats North Dakota State, the Zags face the winner of No. 7 seed Iowa and No. 10 seed Davidson. Two wins would advance Gonzaga to Houston, where No. 1 seed Duke and No. 4 seed Georgetown will loom if the Blue Devils and Hoyas avoid an upset. Gonzaga’s veterans with savvy play facing Duke’s freshmen is the aforementioned formula for an upset. Nobody understands better than Heathcote that anything can go wrong for a talented team in the NCAA tournament. Two of his better teams lost Sweet Sixteen games it should have otherwise won due to clock malfunctions. Both times the opponent advanced to the Elite Eight Regional title game and won to move on to the Final Four. In 1986, Michigan State was leading in the final seconds before Kansas forced overtime with nine seconds to play and won in the extra session. The nine seconds should never have been played; with 2:12 remaining in the game, the clock had stopped for 11 to 19 seconds, according varying accounts, as play continued. In 1990, Georgia Tech’s Kenny Anderson was credited with scoring at the buzzer to force overtime. TV replays showed the shot was after time expired, but this was before referees could “go to the monitor” for a final decision. George Tech subsequently won in overtime. One consistent knock on Gonzaga is the Zags are untested in the weak WCC. In their non-conference schedule they have wins over four NCAA teams, SMU, St. John’s, UCLA and Texas Southern. Gonzaga lost to Arizona, but it was in overtime 66-63. Arizona is seeded No. 2 in the West and ranked No. 5 nationally. That certainly suggests the Bulldogs can play with anyone.